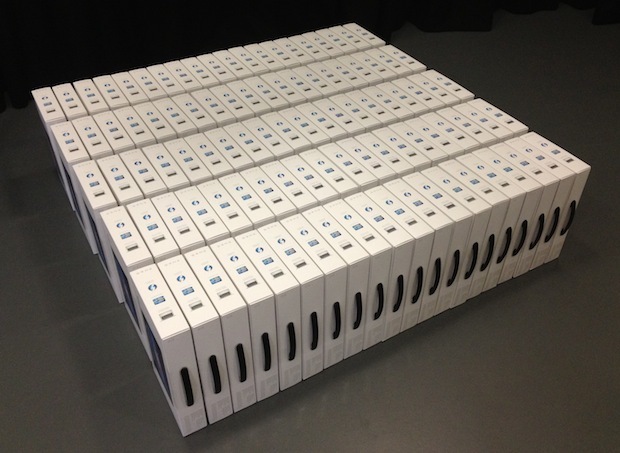 Ever wondered what it would look like if you ordered 100 MacBook Pro’s? Now you know. These neatly arranged boxes aren’t from the living room of some eccentric Howard Hughes-esque Mac fan though, they’re Kent College’s fresh batch of MacBooks for the incoming student cohort this Fall. Each new student there gets a 13″ MacBook Pro with 2.5GHz Core i5, 4GB of RAM, and a 500GB hard drive as part of their 1-to-1 MacBook program, which, understandably, has been a big hit with pupils and faculty alike. Kent College is based in Canterbury, UK has been profiled by Apple Education before for their extensive use of Macs in education. Thanks to Oliver B. for sending this in! That’s a surprisingly artsy picture. I wish my school had such technological ambitions growing up! I used to work for Ravensbourne college in the uk and every year all our first years were gifted a MacBook or MacBook pro. These are photos of a few years ago when I had 1500 MacBook pros and 500 MacBooks to hand out. not nearly as nice as the first picture. That’s a heck of a change from the room full of BBC-B Micros we had when I went there. I wonder if they have a job for an Old Canterburian?